In candy making, chocolate is second only to sugar in importance and frequency of use. Chocolate is unique in that it can be both a fundamental ingredient and a finished candy by itself. Knowing how to handle chocolate, including proper techniques for storing, cutting, melting, and tempering this mercurial substance, can greatly increase your chances of making successful chocolate candies. Chocolate is derived from the beans of the Theobroma cacao tree, but the substance we know as chocolate is very different from the humble cacao bean. Chocolate must undergo a complex and lengthy process before it becomes the smooth, sweet food we are familiar with. The term "chocolate" can refer to a variety of different products, whose characteristics and taste depends on the ingredients and methods used during processing. Chocolate products can range from small milk chocolate morsels to blocks of unsweetened chocolate to bars of white chocolate, with many different variations. There are two main rules to handling chocolate: do not let it come into contact with water while melting, and do not put it over direct heat. 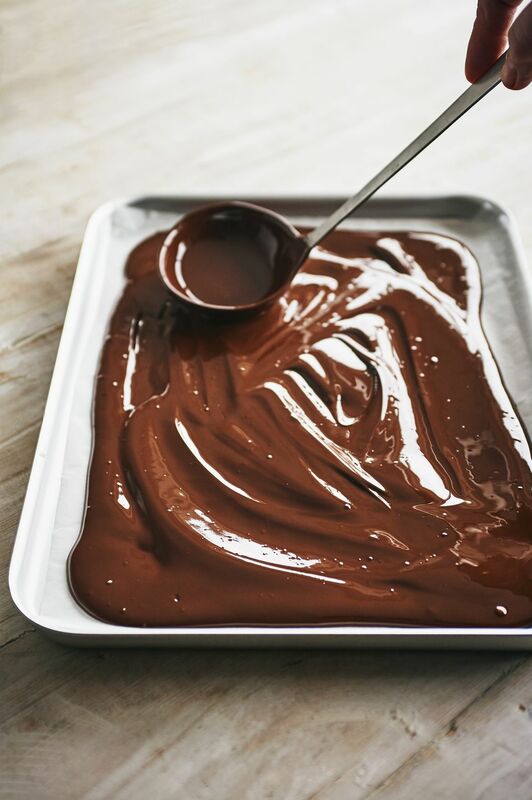 Water droplets that fall into a pan of melting chocolate will cause it to "seize," or turn into a hard, chunky lump. Similarly, overheating chocolate will ruin the taste and texture of the final product, which is why chocolate should always be melted over indirect heat or in small intervals in a microwave. Like other aspects of candy making, working with chocolate does not require a great deal of specialized equipment, but there are a few tools that will make chocolate work much easier.